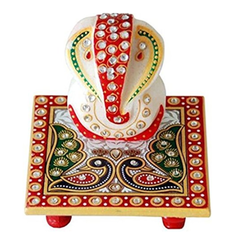 Prominent & Leading Manufacturer from Jaipur, we offer chowkhi ganesh with packing and marble ganesh chowki. We are the Leading Manufacture of Chowkhi Ganesh, we provide you on bulk quantity only. Wea are the leading manufacturer of Finely crafted Ganesh Marble Chowki. This is one of the most economic gift item.